Home / Social Media Customer Services / Why Social Media Customer Services is Your Secret Weapon? – Amy Jo Martin (Social Media Marketing expert). It is a well-known business statistic: it costs five to ten percent more to acquire new customers than to retain an existing one. Though the statistics would vary slightly on the study that you read, but the crux of the story is that: it takes abnormally high costs to acquire new business customers. So, it is essential that your present customers are satisfied. It is interesting to note that more than 82% of customers said they stopped doing repeat business with a particular brand due to poor customer experiences. Such outcomes need to be avoided at all costs and the way to do that is to re-strategize for the customer service game. Mediocre customer services will not fit the bill anymore. Companies should be open to interact and engage with customers, thus providing great customer services. What is the best way of meeting these ends? What is better than social media customer services for real time, interactive and engaging customer support? A study conducted by research group Loyalty 360 indicated that more than 25% of the brands ranked social media as the “most effective channel for customer retention”. The leading reason being that this platform allows the customers to speak directly with representatives from their brands and gather company information. More than 74% of the adult Internet users use social networking websites. Out of this 72% are men, while 76% are women. 71% of all Internet users use Facebook regularly. 23% of all Internet users access Twitter regularly. 28% of users use LinkedIn. Instagram is used by 26% of web users. 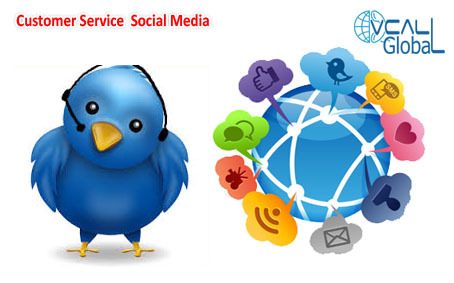 Why Social Media is an Effective Customer Service Channel? Real Time Engagement: Other than the conventional phone calls, no other medium allows companies to engage with their customers in real time. Brands have to understand the psychology of modern day customers, their phones are so feature rich that it is seldom used to make calls. This is why the customers head towards social media to engage or give feedback for services or products. A year back, if a customer got a response from the brand on a customer care issue, the customer would be pleasantly surprised. Today, if a customer does not get response from a company, then they will black mark the company. Keeping Customers Informed: Yes, brands can send out bulk promotional emails or run display ads to inform the customers about special offers or discounts. But what to do if the offer is for a very limited time or it needs to be promoted quickly? You have to turn to social media, it is the best medium for last minute marketing. The brands followers on social media have put their hand up to be kept well informed. Trust Building: With social media engagements you can get closer to the existing customers and build relationship. Strong relationship between both the parties means there is a high probability that the customer will be turned into a brand ambassador. Such loyal customers can be valuable marketing tools to promote your brand with their word of the mouth sales and positive reviews. Presence is Crucial: the old verbiage “Set it and forget it” does not work for social media customer services. Real time engagement is the keyword for this type of customer service. So, there has to be someone to respond in real time to the customer queries. Too many brands spoil the potential of social media with once or twice a day social media appearances. Value Time and Stay Relevant: Social media is an engagement medium where the rules of marketing need to be tweaked. Many brands want to attain cross selling and up selling benefits each time they engage. This drives away the customers. Make sure you answer the queries or solve the problems before politely putting forward your offer. There should always be room for social media customer services in the support policies of any brand. If you have not explored this realm yet, it is better late than never!